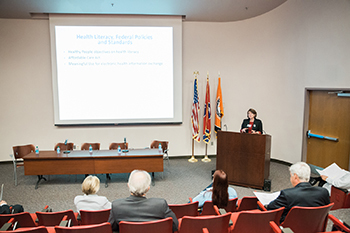 The Health Information Center at The University of Tennessee Medical Center sponsored the first-ever Tennessee Health Literacy Forum. Approximately 100 health care professionals, educators, librarians, and government and business leaders from across the state of Tennessee attended to address the importance of health literacy and its influence on patient health. Cynthia Baur, PhD, senior advisor for Health Literacy and the senior official for the Plain Writing Act with the Office of the Associate Director for Communication for the Centers for Disease Control and Prevention, opened discussions with the keynote address. Discussions at the forum focused on the need for health care providers to improve their communication with patients by using simpler language and to guide patients in accessing educational resources such as the HIC. Attendees expressed interest in continuing the discussion in the year to come with the goal of another forum at the medical center in 2016.